Convertible arbitrage involves purchasing a portfolio of convertible securities-generally convertible bonds-and hedging a portion of the equity risk by selling short the underlying common stock. This increasingly popular strategy, which is especially useful during times of market volatility, allows individuals to increase their returns while decreasing their risks. Convertible Arbitrage offers a thorough explanation of this unique investment strategy. Filled with in-depth insights from an expert in the field, this comprehensive guide explores a wide range of convertible topics. Readers will be introduced to a variety of models for convertible analysis, "the Greeks," as well as the full range of hedges, including titled and leveraged hedges, as well as swaps, nontraditional hedges, and option hedging. They will also gain a firm understanding of alternative convertible structures, the use of foreign convertibles in hedging, risk management at the portfolio level, and trading and hedging risks. Convertible Arbitrage eliminates any confusion by clearly differentiating convertible arbitrage strategy from other hedging techniques such as long-short equity, merger and acquisition arbitrage, and fixed-income arbitrage. In Convertible Arbitrage: Insights and Techniques for Successful Hedging, renowned investment expert Nick P. Calamos shows you ways to make the most of convertible arbitrage, explaining how to boost returns while decreasing risk–no matter what the market is doing. The practice of convertible arbitrage takes advantage of the unique hybrid nature of convertible securities, which combine both fixed-income and equity characteristics. It typically involves matching a long position in convertible securities–usually convertible bonds–with a short position of corresponding stock. The bond pays interest and guarantees a yield upon maturity–but you also can participate in the movement of the underlying stock because a convertible bond’s option component makes it readily convertible into stock. Convertible arbitrage thus allows investors to create positions that achieve either market-neutral returns or that have a bias towards a security’s future price, offering tools to both the defensive and aggressive investor. The array of convertible securities available–and the ever-shifting financial engineering behind them–demands a practical working knowledge of convertible arbitrage hedging techniques. Not only does Convertible Arbitrage put those techniques at your fingertips, it also helps you use those techniques to prepare for–and profit from–new twists in convertible terms, types of securities, or derivative hedge products. "The Calamos Convertible Fund offers the Holy Grail in investing–a long-term return superior to the index with less volatility." 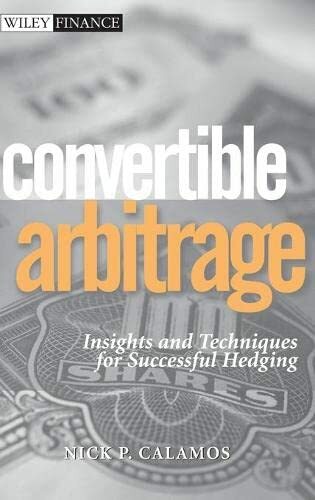 "Finally, we have a comprehensive, practical, and lucid book on convertible arbitrage from one of the most seasoned investors in this growing asset class." "Nick Calamos is one of the most experienced and successful convertible bond managers in the mutual fund industry. Who better to explain convertible arbitrage strategies?" "Convertible Arbitrage is an indispensable resource, and is required reading for all fund of funds analysts and portfolio managers that cover this strategy." In good markets and bad, convertible arbitrage can give investors the best of both worlds: the safety of bonds and all the possibilities of stock-like performance. This is partly why convertible arbitrage–following the larger trend of hedge funds–has moved to center stage in the last decade. But profiting from this increasingly popular investment strategy takes much more than knowing a few ground rules. It takes Convertible Arbitrage: Insights and Techniques for Successful Hedging. Nick P. Calamos is the first recipient of the Excellence in Fund Management Award for Calamos Growth and Income Fund, bestowed by S&P and BusinessWeek.